In the Name of Gucci: A Memoir, by Patricia Gucci will be available in stores tomorrow - Tuesday, May 10, 2016. Patricia Gucci was born in London and is the only daughter of Bruna and Aldo Gucci. Patricia was educated in England, Italy and Switzerland before moving to New York to study acting, despite her father's wish that she dedicate herself to the family business. In 1982 after a year of study her father's wish prevailed and she was appointed to the board of Gucci and roving Ambassador in the US and Asia until the sale to Investcorp in 1987. Aldo Gucci was born in 1905 to Aida and Guccio Gucci – the company’s founder. 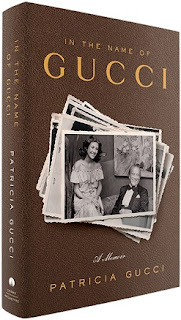 Patricia's father was the visionary responsible for developing Gucci beyond its Florentine roots and turning the company into a global luxury brand, opening its first store in Rome and then launching in New York in the 1950s. His pioneering spirit led to a string of stores across the US and beyond, establishing Gucci and the Made in Italy brand like no other before him. Patricia is establishing a legacy of her own, developing biographical projects based on a collection of diverse experiences and a unique perspective. WHAT: Conversation with Patricia Gucci and Wall Street Journal reporter Marc Myers followed by a book signing. 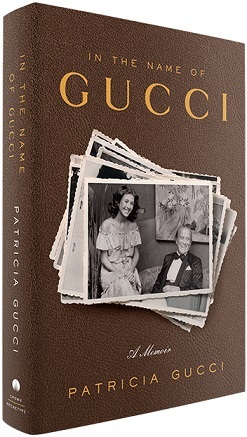 In the Name of Gucci: A Memoir, by Patricia Gucci (Crown, on sale May 10) is the first book written by a direct descendant of Guccio Gucci—Patricia’s grandfather and the company’s founder. It chronicles her life as the secret love child of Aldo Gucci and Bruna—the woman he fell in love with when she was just eighteen, and remained at his side until his death at 84 years of age. What started out as an affair became a lifelong commitment and for the last 20 years of his life, long after he had been estranged from his first wife Olwen, it was Bruna who was considered his wife in the US, culminating with their marriage in the 1980s. Woven throughout the book is the complicated, but loving father-daughter relationship between Aldo and Patricia Gucci, the first woman in the family to be elected to the Gucci board of directors, and who ultimately became his sole universal heir. This is a daughter's bittersweet tribute to her beloved father which traces Aldo Gucci's marketing brilliance and stamina in establishing Gucci as one of the world's most iconic brands. He was the first Italian to set up an Italian luxury goods retail operation in the US, opening on Fifth Avenue in New York, Worth Avenue in Palm Beach and Rodeo Drive in Los Angeles, paving the way for the 'Made in Italy' phenomenon throughout the world for countless others to follow in his footsteps.